Adivasi & Bodo youth selected to join Army, Para Military forces. June 2, 2016 Newsdesk 0 Comments Adivasi, Bodo youth, join Army, Para Military forces. District of Assam has long been plagued with the strife of terrorism, causing the people to struggle to live a decent, safe life and the youth being misguided. The Charduar Regiment, under the “Ball of Fire” Division of the Indian Army, realized that employment & a goal of life was the best means of alleviating the people’s problems. Thus, the Regiment selected 120 able Adivasi & Bodo youth and trained them for competing in the recruitment for Indian Army & Para Military forces. 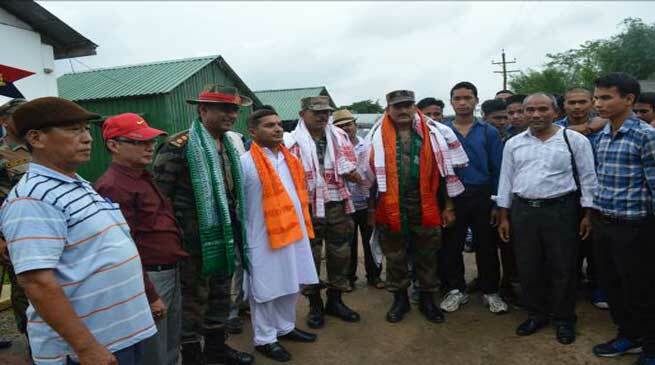 As a Result, a record number of 41 youth have been selected for the Indian Army, Assam Rifles & Assam Police. It is a matter of pride for the villagers as their youth don the uniforms. As quoted by thePanchayat President of Charduar area, himself a veteran,”We have served for 30 years& lived here for 25 years more,this is the finest example of such a spirit as shown by the Army here”.